Here’s part 2 of ‘The origin of me as a sci-fi fanatic’ (click here for part 1). Thank you for staying with me! 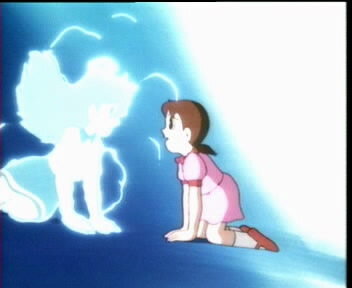 This post will continue the discussion about ten classic sci-fi feature found in Doraemon: Nobita and the Robot Army, the anime that lead me into the world of science fiction. Let’s begin with the fifth one! Since Doraemon possess a personal time machine. 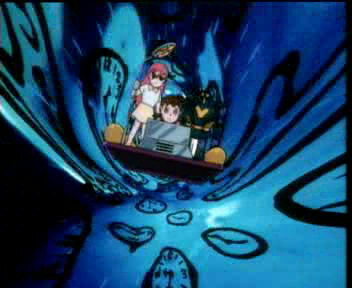 Time traveling, naturally, appears in most of Doraemon’s stories. In the majority of these stories, Time traveling is the key to bring Doraemon and friends to numerous exotic places like the dinosaur era, the ice age, prehistoric Japan or the far future. In this particular movie, going back in time is the mean to correct the mistake of the past and consequently solve the problem of today. It is a chance every person on this planet has hoped for but is never granted. four kids and a cat robot against an entire army! Like every epic sci-fi stories, the safety of humankind and Earth itself is at stake here. Yes, Doraemon and friends stand up and fight the invading army to protect the Earth from total anihilation. And guess what, this is not their first time! Though using air-pressure guns and glue shooters against the fully armed army is quite rediculous, the anime’s spirit of saving the world has never been stronger. Another classic theme explored and re-explored over and over in sci-fi stories since the dawn of time. And on one seems to get tired of it. Lilulu is an android sent to Earth to make preparation for the robot army’s arrival. 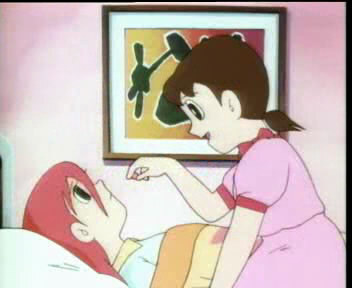 At first she seems to be obediently following orders but after meeting Shizuka, she starts to have the idea of her own. Towards the end, she regards Shizuka as a ‘friend’ and cries (oh, so she has had tear ducts and glands installed at some point in the past). What’s really special is that the anime never tries to raise a debate whether androids possess hearts and souls but instead deliberately treats androids as fellow human and friends with real souls. This one is an extremely common theme in science fictions and probably the most conspicuous topic in Doraemon since, in case you haven’t noticed, Doraemon and Nobita are best friends. In this anime, the androids represent people who are different from the majority of population. The hidden message? Children’s hearts (in this case, Doraemon and friends’) are far wider than adults. They see through fresh, through artificial skin and all the metallic bodies of androids. They embrace difference and diversity with open arms. In the end, what resolves all the problems are the friendship Shizuka gives to androids and Lilulu’s desire to live in harmony with human. …is not clearly focused in this movie but many other Doraemon movies are so green that even blind people can perceive it. Nevertheless, the scene depicting robot army setting up the base in the forest does make a subtle implication on human’s civilization replacing the green zone of the Earth. My goodness! 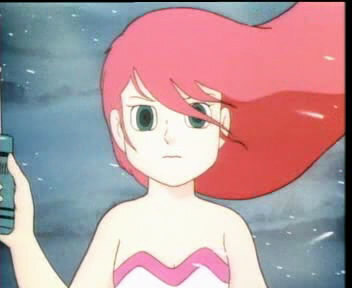 I’ve been rambling endlessly about this anime. I can hardly believe that a single movie can contain so many classic themes! 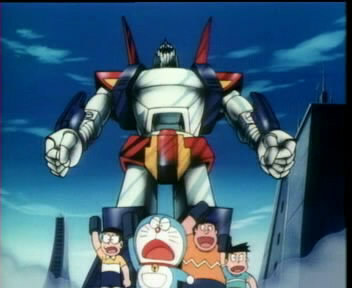 I don’t know what other people might say but for me, Doraemon: Nobita and the Robot army is the greatest sci-fi anime ever! This is the anime that started every thing and will always be part of me forever. Thank you for reading all the way through this long post. If you have any comments, do not hesitate to share them here. ps. consider this article as a review in itself. The rating is A+ (as if it could be anything else). This entry was posted in Articles, Movies and tagged Doraemon, mecha, Nobita and the Platoon of Iron Men, Nobita and the Robot Army, Nobita and the Steel Troops, sci-fi. Bookmark the permalink. LOL, having a joint and back pain in such young age. Don’t push yourself working too hard! Wow, even though I don’t specifically try to look for sci-fi type anime, all these reasons/points DEFINITELY ring true. I LOVE time-travel, good-vs-evil, all that. But I’m ESPECIALLY interested in the whole “androidal-soul” thing. I mean “A.I.” (non anime movie) was great with that and a couple of the things you mentioned too. Very interesting. Nice! I’m not familiar with the subject material, but I think the ‘Battle to Save the World’ is a trait which goes further up the hierarchy. …many other Doraemon movies are so green that even blind people can perceive it. Hehe. Thanks! Glad you had fun reading this post. Point eight is so blatantly obvious yet not really. It wasn’t until I read it that I remembered Doraemon is an android. He always just really felt like another kid or a good friend with cool toys, not the android to help Nobita out. I guess this speaks to the success the author had in portraying their relationship. I believe that’s what happened to me when I watch the series. Resulting in me never being too fond of Doraemon. Though I did manage to catch 2 Doraemon movies when I visited my baby cousins. Not surprisingly, the movies were fun. As compared to the series which felt boring to me. Even having not watched much Doraemons. I too noticed point 1, 4 and 5 being the most frequent. Existing in almost every episode I believe. Typing this comment reminded me another reason why I disliked Doraemon, the anime. I hated how the fat guy and his friend (the one with the pointy face) bullied Nobita all the time. 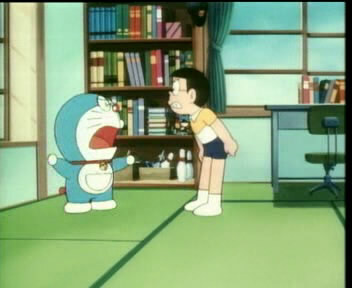 And instead of making a stand, Nobita normally goes running to Doraemon for a solution of sort. Oh, Nobita has been like that all along but there are a few critical moments that he actually stands up and takes the lead. These moments are mostly in feature film, not the series. BTW, your baby cousin did like Doraemon, I presume. Wow. I’ve read thru part 1 and 2 and I must say I am amazed at how well you’ve written this post down. I never knew Doraemon had such a deep meaning to it. Whenever I thought about sci-fi Anime I would always assume the Mechas and futuristic titles. Thanks! I’m really happy to hear that you enjoy my post. My favorite topic here is probably Artificial Intelligence. I wonder sometimes if it’s possible to create a Intelligence that can be compared to human. And if true, how it will react ? AI that is as smart as human is very possible but creativity…that’s a different story. YAY for time travel. Sci fi is always fun when you have the element of time involved in some way. I always loved the Time Paradox episodes of Trek. Like “Times Arrow” from ST:TNG which starts off with Data digging up his own head! Oh I miss time travel. Newer movies and anime rarely touch on this subject, as far as I know. Great retrospective/review! This is definitely one of the best books/movies in the series. So much so, that I went out of my way to read and watch it in all three forms. I love it. Great concept, and brilliant execution. As you described, the movie is pretty much sci-fi in a nutshell. To be honest though, as much as I love this movie, I don’t really care for sci-fi. There are a few exceptions (The Back To The Future trilogy), but overall, it’s just not my thing. P.S. I think I’m a bit late in saying this, but Happy Birthday Doraemon!